Broken Home Appliance in Bromley? Have you ever been in a situation, where the most used kitchen appliance in your home gets broken? Do you buy a new one? Not necessarily. The other option that you have, is to call someone who offers appliance repair in Bromley. This one is also the cheaper one, but whom can you trust? When would be the soonest availability, and how long do you have to wait, before they bring the appliance back? And how much is the service going to cost? You don't have to worry about these things, because our team at "HappyAppliances" is here to help with our London Appliance Repair Service! We are a team of fully qualified, experienced, dedicated, friendly engineers, which have gone trough many trainings. We have seen so many different situations with all kinds of different brands and models kitchen appliances, there is not one, which can make it difficult for us. We know how to deal with your washing machine, hob, oven, cooker, dishwasher etc. and will do it the right way. We will surpass your expectations, and what is better than a team you can count on? A team, that will justify your expectations! That is exactly what we are going to do. What would be the best time to call us? The answer is "whenever you need us" - no matter if it is on weekends, early in the morning or late in the evening. We will always be there for you. We work at times, which are convenient for you, because we understand, that it is very difficult for a household to function without an oven or a fridge. 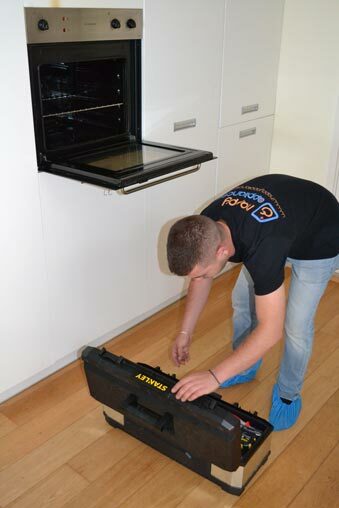 We know, that the job must be done as quickly as possible, no matter which appliance needs repair. If you are wondering about the exact time of our arrival, don't - we always call our clients 30 minutes before we arrive, to make sure that you will be ready to meet us. But this is not the only thing we are good at. Our engineers will install your kitchen appliances just as good, as we would repair them. We know, that your warranty will not cover any damage in the future, if the appliance has not been installed by a professionalist. Which is why we are ready to help. We will do the job more than just "good", and you will be satisfied and happy with the result. Contrary to your expectations, we do not charge a lot for our services. Yes, we provide high quality services, we take good care of the clients and products, we know how to fix and install everything you need for your kitchen. But our prices are reasonable, because we know how important it is for you to get your appliance fixed or installed, without having to give a lot of money. We aspire to offer a good Appliances Repair Bromley service on a good price - we want you to be happy and satisfied. One of our greatest advantages is the fact, that we work fast and easily reach every part of Bromley. But how do we do this? Thanks to our hi tech vans. They help us to move around quickly and we are always on time. But this is not their only advantage. In them we keep all kinds of different replacement parts for the different brands of appliances. Even if we don't have any part available, we can easily provide it with one call to the right place. If you need help with repair or installation of kitchen appliances, don't hesitate to contact us.